People walked to Reagan National Airport and waited in hourslong lines for Metro bridge bus service as the rain, the holiday weekend and the closure of two Metro stations contributed to a nightmare Friday evening commute. The National Airport and Crystal City stations along the Blue and Yellow lines are closed through Monday, with shuttle buses replacing trains between Pentagon City and Braddock, but riders shared photos of huge crowds waiting to get on those buses. More Metro buses were added Saturday morning, with some bypassing Crystal City to serve the airport more quickly. The worst traffic had subsided, but travelers should continue to budget extra time to get to and from the airport. WMATA apologized in a statement, saying the mix of traffic and weather caused shuttles to be delayed as the backups rippled through Arlington. “Traffic is terrible, and you know it’s really bad when they’re talking on the radio and the news shows up,” said one man trying to pick his brother up at the airport. “I’m probably going to tell him to take a cab and go the other way,” he said. Riders didn't move much faster once they got on the buses or in cabs as major gridlock affected Crystal City and the George Washington Parkway at National Airport. The airport pointed to the Metro closures as the cause of the gridlock there. Passengers arriving on flights and trying to depart from the airport should use caution on the curb and only cross at marked crosswalks. Consider meeting your ride in a terminal garage where parking is free up to 60 mins. At the airport, people sprinted from cars to the terminals and gates to get to their flights on time. Some travelers decided to walk to the airport, with people dragging their luggage on the GW Parkway. 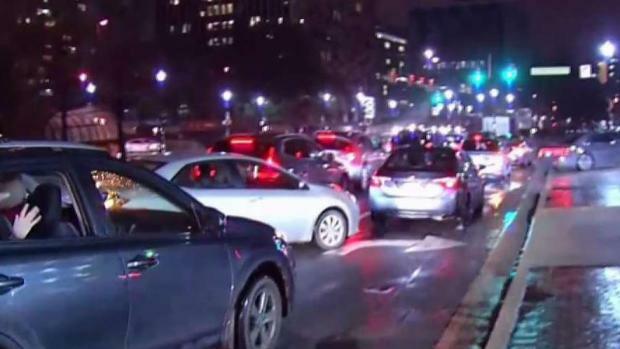 Jackie Bensen spoke to a woman pushing a shoulder to Reagan National Airport after the Friday evening commute became a nightmare with gridlock around Reagan National Airport and long lines for Metro shuttle buses as Metro closed two stations for weekend maintenance. People walking to the airport can use a tunnel from Crystal City that goes under the train tracks to a ramp over the GW Parkway. "I know you’ve got a lot of work going on, @Reagan_Airport, but this is a madhouse," said Twitter user @CGsquiggles. He said he was told by Metro employees that the wait to ride a shuttle out of the airport would be more than two hours. "I’m a patient person, but this is ridiculous. Maybe some rope & stanchion to create an actual line. #wmata," said Twitter user @aej_dc. "Finally got to National Airport and It. Is. Chaos. Good luck getting a ride out in under two hours. Will shortly be coming back to all this. #wmata," said Twitter user @MSalt69. Traffic finally started to ease about 8 p.m. Metro tweeted an update about the same time. "Our operations team is currently monitoring the shuttle crowding between Pentagon City and Braddock Road, including National Airport," Metro said in the tweet. "The mix of traffic and weather are impacting our ability to continuously move our shuttles." Metro says the work was rescheduled from Nov. 2 through Nov. 5 to reduce the impact on commuters. They chose the holiday weekend for the four-day project so only one commuting day would be affected. Metro released a list of alternate bus and rail routes that may be more convenient for those traveling to Crystal City or Reagan National Airport.